A quick one today. 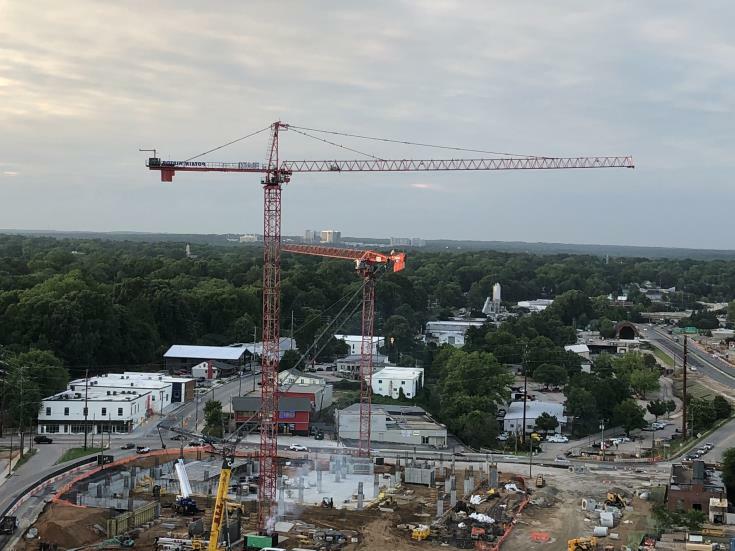 I’ve been enjoying this shot from The West looking at Smokey Hollow and the second crane being built over the site. This summer we should really see a lot of construction activity in this area. The Revenue Building at 2 Salisbury Street – Think about the possibilities of this building. My first thought is a beautiful boutique hotel with a restaurant/retail. What an amazing location with views of the capital building! I have often dreamed of this happening in 1 W Morgan St.
@TheNightHawk Whatever the state decides to do with those buildings, I really hope they don’t move the jobs themselves out of downtown. State, local, and federal government in Raleigh should be concentrated in the city center, it’s a somewhat recession-proof industry that can support a lot of ancillary development like retail/housing when the inevitable downturn hits the private sector. That said, I think they can absolutely consolidate office space and maybe get rid of those enormous parking lots ringing the state office buildings near the Capitol and Halifax Mall. @Kevin – Oh, I agree.. Definitely don’t move the jobs out of downtown.. but maybe move and consolidate them in a new tower or something. TheNightHawk, last year Steve Malik proposed building a soccer stadium downtown on the site of the current state government complex and in conjunction with that, John Kane would build office towers to accommodate displaced state employees. They better not move us out of downtown. I suffered a commute to the ‘burbs for years on the promise of moving downtown. Finally we moved downtown in 2012. I bought a house walking distance from that downtown office. The talk I’ve heard here and there is Revenue gets moved out because they are more like a call center and warehouse operation. Dobbs and LOB are getting old and there are constantly repair trucks fixing water main breaks, elevators stopping and loss of HVAC and such. I think a tower immediately north of the Admin building, with a connecting bridge over to the Legislature terrace, would be ideal. Parking incorporated in said tower. Also move the Seaboard Building (historic train station) over to Edenton St in between the History museum and the Richard Haywood House and use it as a museum annex with train and/or civil war history (the first two stories were built in 1862, during the war). Hi all, I’ve been dropping hints but will start ramping up the migration process over the next week or two. Let’s move the conversation about State Government over to the DTRaleigh Community. I’m looking for members and I hope all of you will embrace it. It’s a much more powerful discussion platform than here on the blog. Expect to see me tighten up these comments and eventually close it in the coming weeks. that the council members like option 1 , a 20 story tower , & they want to get as much information as possible to consider in their next work session ! Their vote was 5 to 0 on learning more about option # 1 ! Leo, I signed up for the forum but the activation email never came. I checked my spam folder too. Got the confirmation email now. Wow that is great news Dwight! Was not expecting them to vote for the 20 story building at all! I don’t see this council approving a tax increase to pay for a 20 story municipal complex unless they hide behind a bond passed by voters. Not very likely. It would require a massive deck for parking (which employees pay for) unless the City waives it’s own rules for their project and allows less than code requires. Parking is $18 a day at Dillon and $150 month at RMB deck now with waiting list over 60. You can’t pay a cop 40K but all for a 20 million complex. Hey Jeff. Glad you got the email from the forum. I was tinkering with email settings as recently as last night so perhaps the changes haven’t propagated out? I’m going to still do some testing and I hope the signup experience is a good one. I’m on it! I don’t give two *you know whats* about the height. However, an alternatives analysis done on the proper timeframe will eventually yield 20 stories as the most cost effective scenario for x year horizon. Making the data fit the preferred outcome 101! It’s a 20 story office on top of a 1 to 2 story civic platform so the entire structure will be 21 to 23 stories high. I’m good with 20-23 floors. What’s more important to me though is that civic platform and the sidewalk experience. 20+ is awesome. Keep building.